WTF Are You Reading? 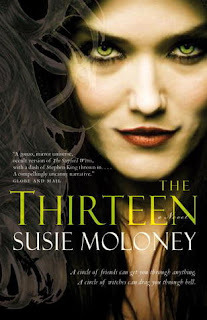 : Adult Paranormal Review: Don't Count On "The Thirteen"
Adult Paranormal Review: Don't Count On "The Thirteen"
This book has a serious case of "it would have been so much better if." 1. It would have been so much better if the villains in this story had been younger. If the synopsis is to be believed, readers will be expecting "Desperate Housewives and what we get is "The Life and Times of Bewitched Gone Wrong." 2. It would have been so much better if so much of the story did not center around the death of one person. True this person is of great import to the central characters of the story, but let's face it...he's dead! It's a done deal! Stop talking about it already! 3. Again with the flashbacks. We spend 74% of the book wandering down memory lane in confused circles before we ever get to the "good part" of the story. That is far too long to spend with a book and not be getting anywhere. 4. It would have been so much better if this book were a movie. It seems as though that is the medium that this story was meant for. This story leaves a great deal of room for the creative license that the large or small screen would allow. This is not a bad read. This is the book that you take with you to the beach when you have the kids and need something that will pass time but not distract you. There is far to much time spent in the past with this read and the present is treated almost as an after thought; though it is quite clear that the present is where all the action is. The book is called "The Thirteen" but the story centers around 6 characters at most. It is not until well into the book that the "Thirteen" are introduced. The focus of the story would be better placed on them. There were a large number of cats and dogs in the story. That is one of its saving graces if the truth be known. You want to keep reading just to see what is going to happen with them. In most cases they are smarter than the humans in the story. There is an ever present "creep" factor that is maintained throughout this story. It progresses over time from "the thing in the back of your brother's sock drawer" creep; to "can't sleep without the nightlight." The best thing about this book is the end. That is where all the goodies lie. The trick is just hanging on til you get there. This book was immediately on my must reads list after reading other books by this author. I was not disappointed.